Information is king and your UI should be set to help you every way possible. 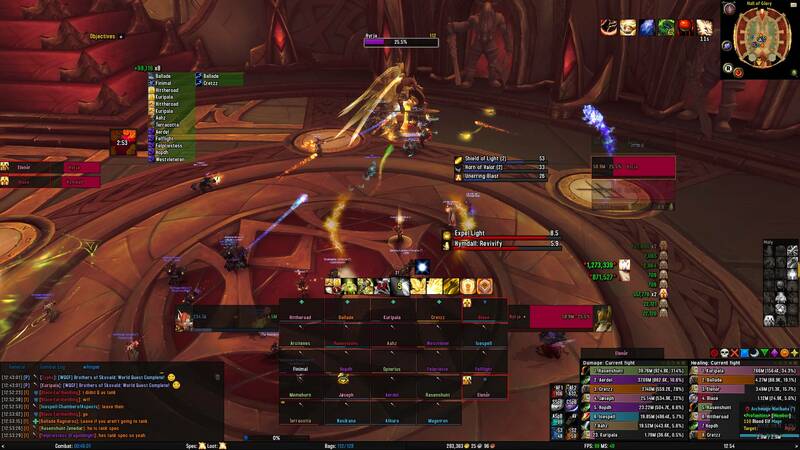 Having well set up raid frames is crucial for healing. WeakAuras - Probably the best addon in WoW. Very customizable addon used to track procs,buffs, debuffs, and much much more. BigWigs - Essential for raiding. Seeing what and when is about to happen and being able to plan around it is just crucial to raiding. ElvUI - A full UI package which is really easy to set up and allows you to customise everything the way you like it. Skada - Another essential addon for raiding. A great tool to track and analyse performance for yourself and others. Clique - Makes setting up mouseover really simple and quick, also saves you a ton of macro slots . To use my Holy Paladin WeakAuras, type /wa ingame, press import in the new tab and copy the below strings in and then hit import. I find most of WeakAuras which I then edit for my own needs on https://wago.io/ - a really useful site for finding good WA's.